Balm is sovereign for the brain, strengthening the memory and powerfully chasing away melancholy – John Evelyn, 1679. Lemon Balm. Just the mere thought of its uplifting aroma and cleansing taste brings happiness and ease to the mind and spirit. It has been mentioned and used since the earliest recorded history of herbal healing, from depression to colds. Not only does Melissa offer medicinal benefits, but also makes a delicious tea, is an excellent flavoring for food and salads. In addition, its powerful volatile oil is a key element in aromatherapy, including many perfumes and cosmetics. A member of the mint family, Lemon Balm is a fragrant herb adored by bees that have a recorded use dating back thousands of years. Melissa even comes from the Greek word for “honey bee”, and was rubbed on beehives to encourage bees to stay together and attract more. Early herbalists, such as Avicenna, coined the term “it makes the heart merry” which it continues to do throughout history. To this day, it is used for the treatment of depression, anxiety, and insomnia. Another famous physician, Paracelsus, claimed that the herb could revitalize every part of the body and even had a preparation named primum ens melissae. It was so well known as a healing herb that even such royalty as King Charles V and the Prince of Glamorgan drank the tea every day. The Prince lived to be 108 years old. Because of its reputation to strengthen the heart and lift the spirits, it was an important ingredient in Medieval cordials, also known as “elixirs of youth”. In fact, the other part of Lemon Balm’s name, officinalis, means “of the workshop”, alluding to the medieval apothecary shop. The leaves steeped in wine and used as a compress have been said to be a potent remedy for scorpion stings. A decoction of the leaves was said to be used as a mouthwash for aching teeth. In Colonial times, lemon balm was used by housewives to add to salad, float in soups, chop in butter and as decorations for main dishes. Lemon Balm is notorious for successfully treating a wide variety of ailments. Some of its most famous uses are for fevers, depression, nervous tension, digestive aid, headaches, menstrual cramps, and heart spasms. Because it acts as a sedative, the leaves are also reputed to lower blood pressure. Lemon Balm is an herb that can be given to children and the elderly because of its gentle nature and effectiveness. Although it is gentle, it is also potent – made into a tea, it encourages sweating to help rid the body of toxins thus relieving such ailments as colds, flu, and fevers. Lemon Balm shows amazing antibacterial and anti-viral properties and has been proven to help combat mumps, cold sores (Herpes simplex) and other viruses. In addition, there have been studies done that have shown the herb to slightly inhibit the thyroid-stimulating hormone and restricts Graves disease, a hyperthyroid condition. Lemon balm contains antihistamine properties useful for treating eczema and allergic reactions. Externally, the herb is favored for treating insect bites and minor wounds. Lemon Balm can also be used the same way other mints are, for upset stomach and gas. The volatile oils are used in aromatherapy for easing depression and calming nervous tension. It has been suggested that drawing a hot bath with the herb leaves will help women with delayed menses. Lemon Balm not only helps humans but also dogs, cats and those in the plant kingdom itself. Steep 2 teaspoons of the herb in 1 cup boiling water; spray on houseplants to repel insects and flies. It can be substituted in baking recipes for lemon rind. In pre-Hellenic mythology, the priestesses of Aphrodite were called Melissa. Aphrodite was regarded as a fertility Goddess and honey cakes shaped as female images were often made for festivals celebrating and honoring this important Goddess. Lemon Balm was known as the “sympathy plant”, accompanied by the belief that drinking it in wine “deterred the bites of venomous beasts”. The balm has been used in pursuit of romance and in baths to attract love. It only makes sense that its planetary ruler is Venus. Charms can be made and worn to bring a lover into one’s life. Mystical properties include the feminine gender and an association with the moon and water. Balm is a powerful love, success and healing herb. In Arabian herb lore, it is said that the herb can be used to influence love; Pliny stated that its powers so great that “if it was attached to a sword that had made a wound, the blood would be immediately staunched”; ancient Mediterranean cultures believe that by rubbing the herb on beehives, it will bring great success. Lemon balm can be found in rich, loamy, sandy soil in sunny fields and along roadsides. 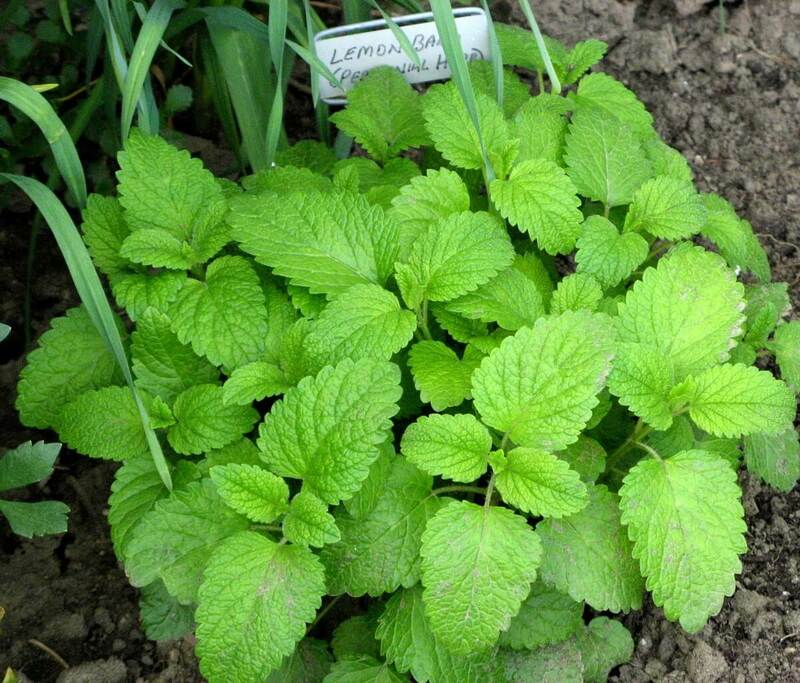 Lemon Balm is a perennial with upright, branching stems which are covered in “hairs”, reaching 3 feet in height. Light green toothed leaves are found growing in opposite pairs at each joint. White two-lipped flowers bloom in clusters at the axis of the leaves, between June and September. The second year of growth yields the most leaves. In 2 cups of boiled water, steep the above herbs for 15 minutes, covered. Strain and serve warm or cool. Drink a half cup at a time, beginning at the onset of symptoms and repeated every few hours until symptoms subside. Safe for children and adults. Steep in 2 cups of boiled water, covered. Strain after 10-15 minutes and drink half a cup to 1 cup to relax. Good to drink when the mind can’t slow down. Mix first 7 ingredients together, then slowly blend in the oil. Mix well before serving. This is delicious on salads, especially fish or chicken salads. You can also marinate tofu, chicken or fish piece in this mixture before cooking. After cooking, serve the vinaigrette as a sauce. Makes about 2/3 cup. Preheat oven to 400 degrees. First, make pastry. Sift flour and salt into medium bowl. Cut in butter until mixture resembles fine breadcrumbs. Add enough water to make a soft dough. Roll out to line a 7-inch quiche dish. Bake unfilled for 15 minutes. For filling: beat margarine, honey, and cream cheese together in a bowl until soft and creamy. Beat in eggs and fold in lemon balm. Reduce oven temperature to 350 degrees. Pour filling into baked pastry shell. Bake for 45 minutes or until filling is golden and set, but not cracked. Serve with whipped cream, or cover the chilled cake with a thin layer of sour cream. Makes 6 servings. Beyerl, P. The Master Book of Herbalism. Cunningham, S. Encyclopedia of Magical Herbs. Garrett, J. The Cherokee Herbal. Griffin, J. Mother Nature’s Herbal. Mabey, R. The New Age Herbalist. Ody, P. The Complete Medicinal Herbal. Rose, J. Herbs & Things. Soule, D. The Roots of Healing.